Doesn't look like much does it? But this has received more positive comments and recipe queries than any other single menu item. This is my winter amuse bouche: cream of mushroom and truffle soup. It's much loved. This is the recipe. But I warn you: it's gonna get ugly. The soup (you might call it a velouté) is a base of much reduced mushrooms, cream, a small amount of white truffle paste and an even smaller amount of white truffle oil. I don't add any garlic, herbs, wines, vermouth or other aromatics. 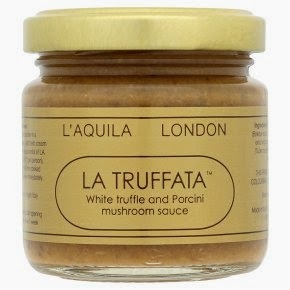 I wanted the essence of mushroom and truffle and nothing else. Personally, I think this wouldn't work as a starter - it's too intense. I make up the mushroom base every few weeks and freeze weighed portions in labelled bags; enough for six people, eight, ten etc. The day before, I thaw the portion in the fridge and just before serving add the other ingredients. This recipe is enough for about 60 amuse bouche servings (50ml). It's not worth making small batches, given the work involved; I'm not even sure if it's practicable either. You start with this many mushrooms. I'm only showing them in a pan here so you can see the amount needed. Which mushrooms? You know the nasty, shaggy, dirty, bargain-price punnets in every supermarket? Them. Clean them under running water (honestly, it's fine, they don't absorb any. Ignore the old tales - I've tested it) and trim the shaggy parts, leaving the stems. Blend/chop/process/pulverise the mushrooms to a rough paste using your kitchen implements of choice. If you're using a blender you may need to add a splash of water. Now you need to heat the paste over a gentle heat. The object here is not to cook the mushrooms as much as dehydrate them. So heat them slowly and watch them, stirring often. A good science or politics programme on Radio 4 helps (me). A big pan is useful as you can spread the mixture out. You don't want a fried mushroom flavour. That belongs with the toms, bacon and fried slice on a sunday morning. This might take 40 minutes, it might take more. Mushrooms are 90% water and we want to send it all to the sky. Sadly you can't leave it do its thing. This part needs vigilance. The paste will bubble, seethe and blip, much like the Yellowstone mud pots. You'll know it's cooked as things turn quiet because when there's no more water vapourising. Be careful here as this is when the paste could catch. It should look almost entirely dry. Now you have your mushroom base. Next, blend it again with a little cream. This needs to be passed though a sieve. I use a tamis (drum sieve). It will look like you're about to do a mega-grout on the bathroom. The result will be a smooth, soft paste like this. No, it's not pretty. I did warn you. This base can now be portioned up and frozen. For an amuse bouche amount you need only 25g per person. To make the soup take some base and defrost. Heat some double cream in a pan and add the base. How much cream is up to you. I mx maybe 1/3 cream to 2/3 base. Don't boil the mix - it spatters everywhere and can burn easily on the sides of the pan. Focus on the texture now: something like single cream is the aim. Sometimes I add a little milk to thin it. To the cream base, stir in some porcini and truffle paste. There are many varieties and even when only 5% truffle they all share an eye-wateringly expensive price tag. Sadly there's not much opportunity for bulk purchase either. This won't keep for long once opened, even in the fridge. You don't need much. for eight people, a couple of plump teaspoons is plenty. Now the seasoning. This is critical. For salt I tend to use both salt and light soy sauce, this adds colour too - a slight but very welcome shift from grey to, well, mushroom. Not too much soy, maybe a tablespoon for eight people. Just a twist of black pepper for interest. Keep the flavours pure. Finally, JUST BEFORE you serve, stir in a little white truffle oil (eyes watering once more). Again a teaspoon is probably sufficient; it's heady stuff. I serve mine in simple shot glasses, eaten with tiny spoons (a lovely Christmas gift from my son Fabian). I used to garnish with a little parsley leaf or chopped chives but no longer. Keep it simple.